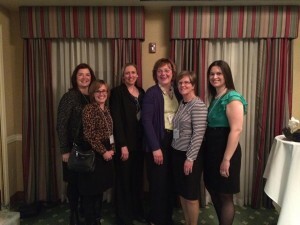 The Leadership Identification Committee was formerly the IASN Nominating Committee. Currently, restructuring updates are ongoing with By-laws, Operating Guidelines, Job Titles, duties and responsibilities of new board positions being developed and implemented. Restructuring IASN for the future. Learn about it here. 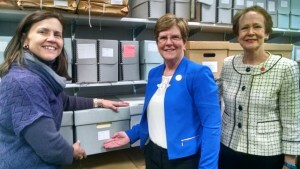 Brigid Lusk, PhD, RN, Director shows Mary Anne Wesoloski, IASN Past President, and Susan Gregory, IASN Historian, the archives of the Illinois Association of School Nursing housed in the Midwest Nursing History Research Center. They are available for anyone wanting to do research on IASN and school nurses in Illinois. 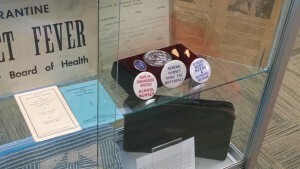 Exhibit on school nursing that contains IASN membership pin and nursing buttons. IASN President Mary Anne Wesoloski and Legislative Affairs Chair Sandra Lawinger advocating on behalf of school nursing at the ANA-Illinois Meet and Greet with state legislators.